It’s all about building relationships. That’s the secret to achieving philanthropic goals that play a vital part in supporting a university like McGill, says Marc Weinstein, Vice-Principal (Development and Alumni Relations) as he prepares to steer Campaign McGill toward the home stretch of its five-and-a-half year public run and use the Campaign’s success to propel philanthropy to even greater heights at McGill. Vice-Principal (Development and Alumni Relations) Marc Weinstein. Having already surpassed $700 million in donations and closing in on the initial $750-million target, Weinstein expects the University to reach that goal this fall and exceed it by the time the Campaign comes to an end in April 2013. He just doesn’t know by how much. Having weathered two tough years of economic downtown, which saw a noticeable dip in private giving, the Campaign enjoyed a bounce-back year last year with a sharp rise to nearly $85 million – a 30-per-cent increase over the previous year. The tough times meant some big gifts just didn’t materialize while others were held back until general economic conditions improved, Weinstein says. But “we have a very loyal base of alumni, parents and friends,” he says, and it could have been worse. Individuals account for about 75 per cent of donated dollars. The remaining 25 per cent comes from foundations and corporations, with corporations only responsible for about eight per cent of the total. “We do not see a very large component from the corporate sector,” Weinstein says, adding that he’s hoping to achieve modest improvements in that area in the future. What happens to all themoney? More than 90 per cent of it is earmarked for specific purposes, largely in support of students through the funding of scholarships, fellowships, bursaries, internships and support for advising. Other gifts have been directed to programmatic and research support, as well as infrastructure projects. And this is where building relationships comes into play. “We can’t underestimate how savvy our donors are,” Weinstein says. “They want to make sure their gifts have a meaningful impact, whether it is supporting students, research or any of the University’s other priority areas. We need to create an opportunity so that through this relationship we can see further philanthropy. “We put a lot of effort into providing stewardship at all levels,” he added, which means communicating frequently with donors to let them know their philanthropy is making a difference. It’s part of building that relationship, because the evidence is clear that once someone starts giving, they are likely to give again. And again. It is important, Weinstein says, to get a donor’s priorities aligned with those of the University, to show donors the kinds of opportunities that exist for making a difference in areas in which they are interested. And it’s a very competitive business, given that there are competing campaigns from various universities running more or less constantly in different parts of the country, not to mention the increase in opportunities for donation that have only been enhanced by the advent of the Internet and social media. 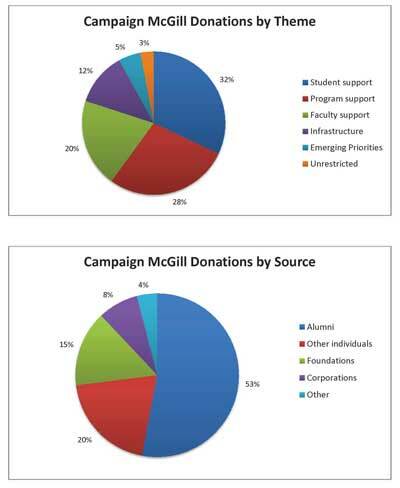 Weinstein also noted the importance of donations and other forms of support from within McGill itself, including the Campus Community Committee, made up entirely of faculty, staff, students and McGill retirees. Last year, thanks in large part to the Campus Community’s engagement efforts, donations from faculty and staff rose in dollar value by 14 per cent, to $1.1 million. And students have kicked in nearly $9 million over the course of the campaign so far. Furthermore, Weinstein says, the Campaign would never have achieved the success it has were it not for the tireless efforts of volunteers, locally, nationally and internationally, ably led by Campaign co-chairs Michael Meighen, Yves Fortier and Eugene McBurney. Weinstein also noted the hard work of so many members of McGill’s academic community, including the Principal, the Provost, the Deans, fellow vice-principals and other members of the senior administration, as well as the many professors who give of their time to meet with donors, showcase their research and represent the University at Campaign events in many of our largest alumni and donor communities. But even if the official campaign counting comes to a close, that doesn’t mean fundraising takes a holiday. In fact, Weinstein doesn’t even like to use the words “end” or “close” when he talks about the Campaign. Instead, he has his mind on a far loftier objective – to use this Campaign’s success as a springboard to bringing even greater philanthropic riches to McGill. The University has set its sights on ultimately raising $100 million a year in cash, something that Weinstein says will only happen when philanthropy is fully embedded in McGill’s culture.